Here is a cake version of the classic Lemon Meringue Pie. Instead of inside a crust, the tangy-sweet lemon curd is spread between layers of cake which was then covered with fluffy meringue. After frosting, the cake is returned to the oven to brown the meringue a bit and create that amazing "crunchy on the outside, chewy in the inside" texture. 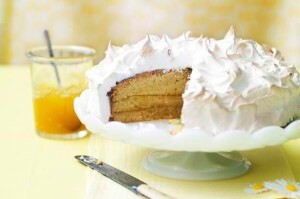 Here is an easy dessert recipe for Lemon Meringue Cake. Heat oven to 325 degrees. Sift together flour, baking powder, and salt twice. Set aside. Place egg yolks in the large bowl of an electric mixer. Beat on medium high until pale and foamy, 3 to 5 minutes. Gradually add 1/2 cup of the sugar, beating until very pale and puffy, 5 to 7 minutes. Add oil in a steady stream. Add zests; beat for 1 minute. Reduce speed to medium low, and add flour mixture alternately with juices, flour in 4 parts and liquid in 3 parts, beginning and ending with the flour. Set aside. In a clean bowl, whip egg whites on low speed until foamy. Add cream of tartar, and increase speed to medium high. Beat until soft peaks form. 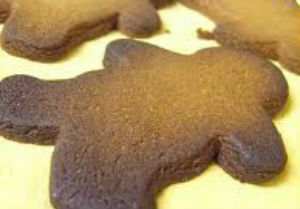 Gradually add remaining sugar, and beat for 1 1/2 minutes, or until whites are glossy and stiff peaks form. Stir a quarter of the whites into the flour-yolk mixture. Fold in remaining whites carefully, trying not to deflate the batter. Gently pour into an ungreased 7-inch tube pan. Bake until cake is golden brown and a cake tester comes out clean, about 40 minutes. Remove cake from oven, and invert immediately. Cool completely in pan. Run a knife around sides to loosen, and remove outer part of pan. Run a knife along bottom and around tube to loosen and remove tube. Turn upside down onto a cake round slightly smaller than the cake, and slice horizontally into 3 layers using a serrated knife. Spread half the filling on the bottom layer, and cover with the middle layer. Spread remaining filling on middle layer, and cover with top layer. Refrigerate overnight, or until set. Brush off excess crumbs with a dry pastry brush. Heat oven to 400 degrees. 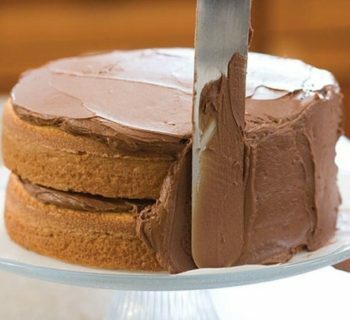 Prepare meringue, and spread it all over cake, swirling with an icing spatula as desired. Set cake, still on cake round, on an oiled baking sheet, and place in oven. Bake, watching carefully, until meringue is brown around edges and beginning to brown elsewhere. Transfer to a serving plate and serve as soon as possible. Slice using a knife dipped in hot water and wiped dry. Fill medium saucepan one quarter full with water. Set the saucepan over medium heat, and bring water to a simmer. Combine egg whites, sugar, and cream of tartar in the heatproof bowl of electric mixer, and place over saucepan. 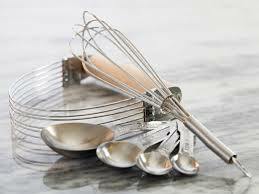 Whisk constantly until sugar is dissolved and whites are warm to the touch, 3 to 3 1/2 minutes. Test by rubbing between your fingers. Transfer bowl to electric mixer fitted with the whisk attachment, and whip, starting on low speed, gradually increasing to high until stiff, glossy peaks form, about 10 minutes. Add vanilla, and mix until combined. Use meringue immediately.